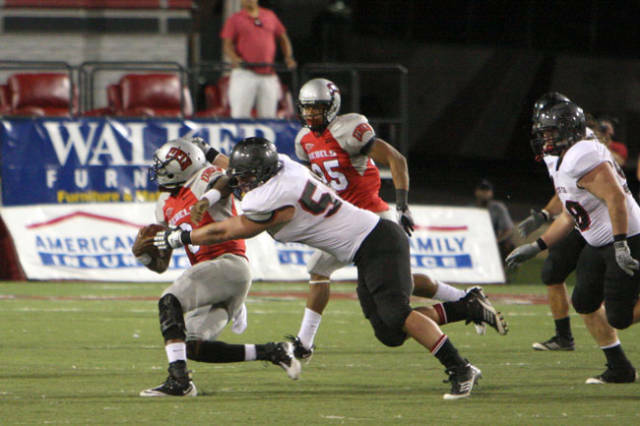 CEDAR CITY, Utah, April 29 – Southern Utah defensive lineman Cody Larsen has signed a free agent contract with the Oakland Raiders. Larsen earned All-America honors from The Sports Network (first-team) and the Associated Press (second-team), was named to the Fabulous-50 by the College Sporting News, and received honorable mention All-American honors from the College Sports Journal following the 2012 season. A first-team all-Big Sky performer in 2012, Larsen was also a two-time all-conference honoree in the Great West Conference, including first-team recognition in 2011 and second-team honors in 2010. Larsen tallied 48 tackles in 2012 playing primarily at defensive tackle. He notched a team-high 14 tackles-for-loss –including 6.5 sacks (which ranked second on the team) – led the Thunderbirds with eight quarterback hurries, co-led the team with two fumbles recovered and was second on the squad with three fumbles forced. He also tallied 18.5 career sacks, which is tied for third on Southern Utah's all-time list. Larsen was tied for 25th in the FCS and fourth in the Big Sky with 1.23 TFLs per game and was seventh in the BCS and tied for 45thin the nation with 0.59 sacks per game.